The areas around a property such as a patio, driveway or walkway should be beautifully designed and appealing to every visitor who comes around. So choosing the designs will involve aesthetic considerations and durability because these are areas that are frequently used by everyone. The most common choice is the stamped concrete because it has features similar to the higher priced finishing materials such as bricks and stone pavers. Out company, the best Stamped Concrete Contractor in Lakeside will help you choose the best option for your project. Before concluding, you should understand the value you will get by using the stamped concrete. This is why we will be discussing the advantages and disadvantages of stamped concrete. There are a variety of choices regarding stamped concrete so you will see some designs that will suit your needs. 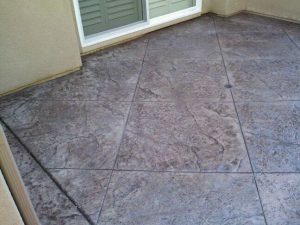 These stamped concrete finishing look like the marble or stone finishing, and they are durable, so it is a win for you. It is also an affordable option that improves the aesthetic appeal in homes or commercial properties. An advantage of the stamped concrete is that it is easy to install. The process only requires mixing the concrete and stamping on the areas to be covered. Rather than the labor-intensive process of moving the heave paving stones to the site. The concrete mixture is basically a standard mix of cement and water done in a way to avoid rough edges which will lead to a poorly finished work. Making a mistake of mixing too much water will cause some problems during stamping. When compared with other higher grade finishing, the stamped concrete has a lower capacity. It tends to crack easily, and it is prone to scratches. However, it can be easily cleaned and maintained to look beautiful. For areas such as the driveways and parking lots, it is best to avoid using stamped concrete in those places because they tend to crack over time. Weather changes and differences in settling can cause cracking of the concrete. This might not be a problem in the Mediterranean weather conditions, but in areas where the weather is harsh with unpredictable fluctuations, the stamped concrete will definitely be prone to cracking. Cracks can be patched, but there will be inconsistencies in the pattern when patching is done too frequently. It might also be too expensive over time if you decide to patch every crack which appears on the stamped concrete finishing. There are other surface finishing options such as the interlocking pavers which cost more than stamped concrete but they last longer and the surfaces do not wear out under pressure from cars. The interlocking designs also do not have a crack because they are smaller units merged together. However, they tend to become loose if the work was poorly done but this issue can be easily sorted out by replacing the loose pavers. No need to worry, we will help you make the right decision for your residential concrete or commercial concrete project.